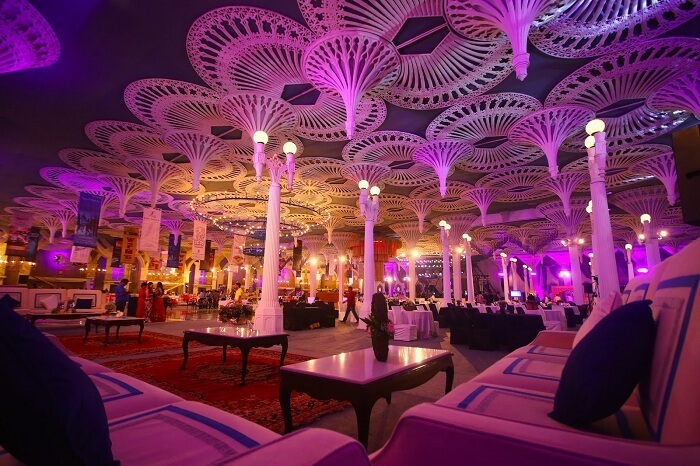 11 Wedding Venues In Gurgaon For That Dreamlike Wedding In An Urban Setting! 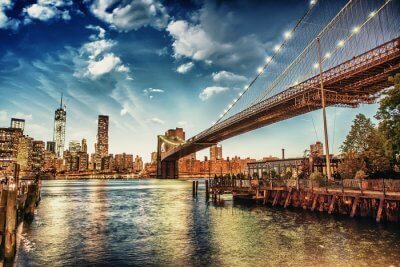 Conflicted because you want to experience luxury, comfort, serenity, and magnificence away from the hustle and bustle of the city on your big day? 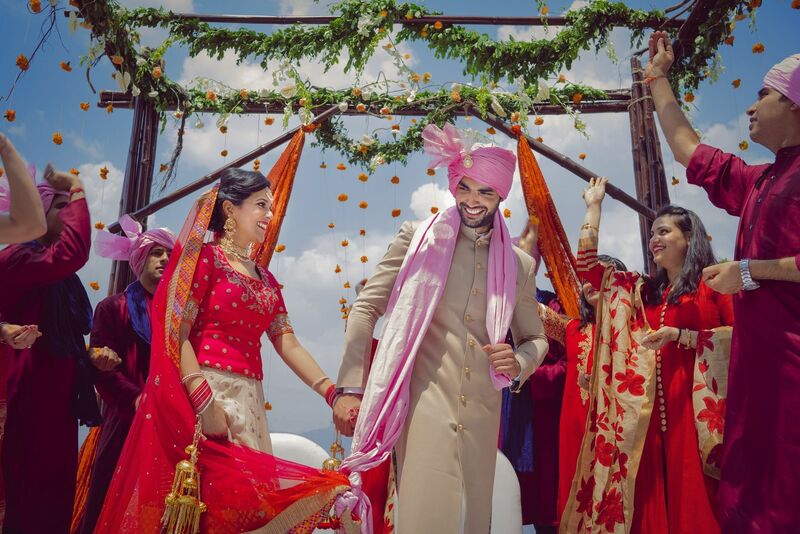 The numerous wedding venues in Gurgaon and around it bring together the best of both worlds, making your wedding day the absolute cinematic affair just as imagined. And the best part, you don’t have to go too far! There’s an endless range of banquet halls, hotels, lawns and gardens, palaces, farmhouses, and even luxury resorts for that dream wedding you’ve been planning to have! All of these provide ample space to accommodate your guests and provide the utmost comfort and luxury during all the major events revolving around marriage celebrations in India like sangeet, mehndi, engagement, ring ceremony, reception, and the main wedding. Dreaming of a lavish destination wedding? There are myriad luxury resorts and palaces in and near Gurgaon where you can get married like a star amid all that jazz and paparazzi! Look no further for finding the perfect marriage places in Gurgaon. So scroll down and pick from one of these extraordinary wedding locations that offer all-inclusive packages covering venue rental, decoration charges, and catering, for that enchanting experience on your special day! Welcome the guests amongst the tasteful surroundings of one of the most exemplary wedding venues in Gurgaon and perform the nuptials basking in the luxury and meticulous arrangements of this magnificent wedding location. Treat your guests to ultimate luxury and class in the enormous Ballroom and Grand Ballroom, banquet halls, and spacious lawns here. This beautiful wedding resort in Gurgaon brings out the little details that make any wedding celebration unique, thereby adding that special personal touch to each event and making that big day cherished forever. Certainly one of the hot favorite resorts in Gurgaon for wedding. 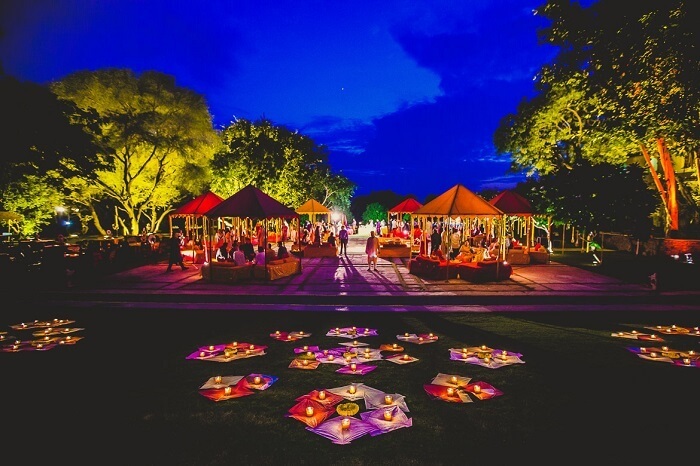 Nestled in the Aravallis, the magical groves and poolside venues of this wedding venue in Gurgaon, cast a bewitching spell, enthralling all with their entrancing beauty. Add to that a special touch on your big day by opting for that distinct flavor in the cuisine cooked by the finest chefs, that satiates not only the stomach but the soul as well. The Taj Gateway also boasts of some terrific wedding lawns in Gurgaon. 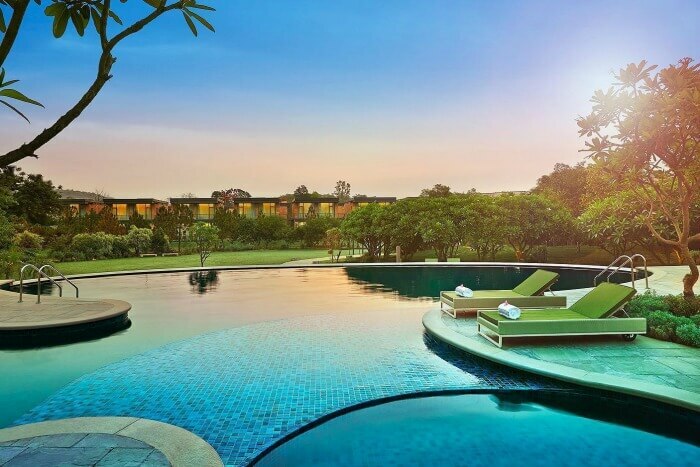 With a premium location and stunning architecture, Trident in Gurgaon is, without a doubt, one of the most stylish wedding venues in Gurgaon where you can lavishly commemorate the milestones of your life, like wedding and reception. From decor, services, to food and beverages, everything about this resort is impeccable and will help make the most beautiful day of your life a truly memorable affair! You can either host your wedding inside the ceiling high and spacious banquet halls of Trident or in the expansive and lush lawns out front. Surrounded by nature’s lush beauty, this luxurious resort shall delight your guests the moment they enter its magnificent ambiance. There can be nothing better than getting hitched in the grand ornamented banquet halls and lavish lawns decorated with frescoes in this haveli style palatial resort. Fulfill your #WeddingGoals amid pure luxury and flamboyance of one of the best wedding resorts in Gurgaon. Other than wedding ceremonies, this handsome haveli is among the best pre-wedding shoot locations in Delhi NCR for all couples who wish to immortalize their beautiful fairytale-like love story forever!! If a destination wedding in Gurgaon is on your mind, the Heritage Village Resort & Spa Manesar could make an ideal fit. Do you wish to wed in a verdant, beautiful forest grove with stunning sights of nature and ultra royal architecture in the backdrop of your stunning wedding photography? Set in an area of 677 acres, Mangar Bani Valley is the perfect location for your Big Fat Indian wedding, the likes of which will make your relatives and neighbours burn with jealousy whenever they are reminded of it! Having hosted numerous successful weddings in its rich natural ambiance, Lalit Mangar holds a prominent position in the list of the best wedding venues in Gurgaon. Celebrating the glory of India, ITC Grand Bharat has the most beautiful wedding garden in Gurgaon that stands as a symbol of unhurried luxury. The plush interiors and bewitching ambiance add to the wedding celebrations making it a royal experience for the soon-to-be-wed and their families. Add a touch of Bollywood-ness to your wedding and get married at the royal abode of celeb couple Saifeena – Pataudi Palace. The palace has transformed into a beautiful resort offering world-class services and hospitality since the Neemrana management took over. So, you can be sure to find the most impeccable arrangements from the decor, seating, food, hospitality, and more on your Big Day. Rose petal-sprinkled fountains, lip-smacking Indian and international food served in gold-rimmed china, prompt and courteous service, a spectacular rose garden, and wild peacocks roaming around the lawns – it doesn’t get fancier than this for sure! 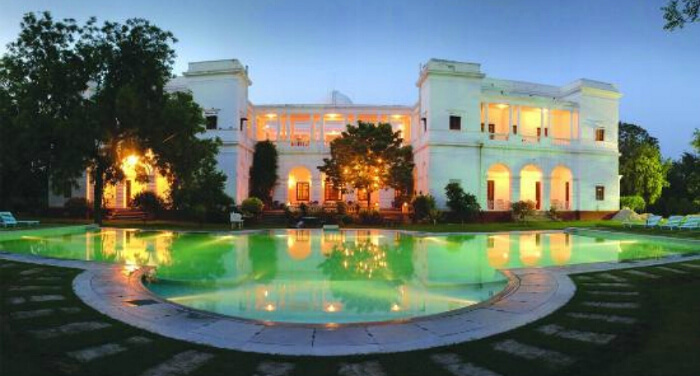 Pataudi Palace wedding on your mind? Set in the heart of Gurgaon, Courtyard by Marriott redefines comfort and luxury. The strategic location of the hotel with its warm ambiance and attentive staff makes it an ideal location for weddings in Gurgaon. 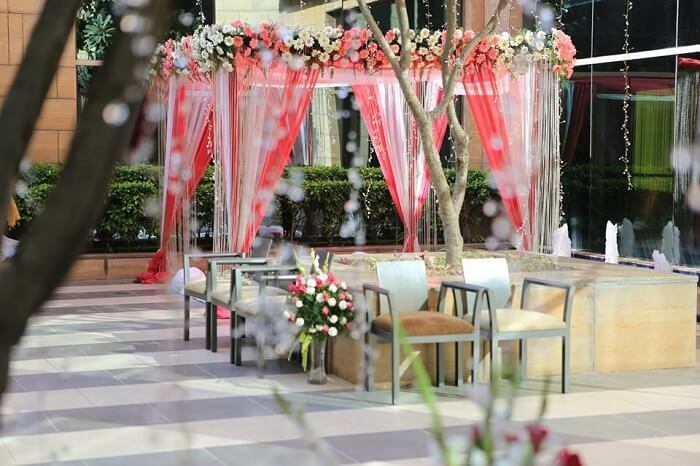 The courtyard is one of the best wedding hotels in Gurgaon as it offers guests a unique ambiance along with the choicest of cuisines served, a fusion that is sure to make your wedding in Gurgaon a majestic and unforgettable affair. Suggested Read: 7 Most Romantic Restaurants In Gurgaon That Are All About Love, And Good Vibes Only! 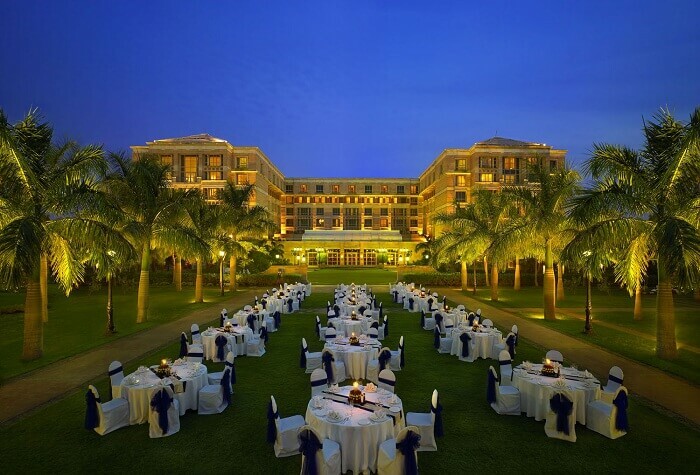 Tie the knot amidst extravagant luxury and the alluring interiors of one of the best wedding resorts in Gurgaon. Customize the wedding events to your liking for that extra charm and grandeur in the celebrations. 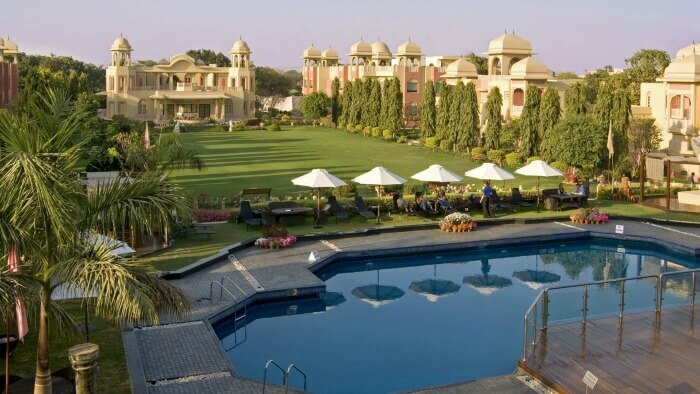 Even though there are many resorts near Gurgaon, this beautifully designed hotel with its sprawling lawns, banquet halls, and rich flora and fauna, adds to the celebratory spirit of weddings, making it one of the best marriage places in Gurgaon. Celebrate the union of marriage with your one and only by picking one of these exuberant wedding venues in Gurgaon. Make timeless memories of your love story in the backdrop of the finest resorts, hotels, banquet halls, gardens, and ballrooms in Gurgaon. 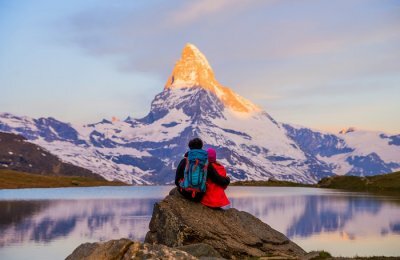 And don’t forget to check exciting honeymoon packages with us. i) Which are some good wedding halls in Gurgaon? A. The Ritz By Ferns N Petals, Emblem Hotel, Pearl Villas, Crowne Plaza, The Bristol, Hyatt Place and The Kundan have some of the best banquet halls in Gurgaon for weddings and other events like reception, engagement, and more. 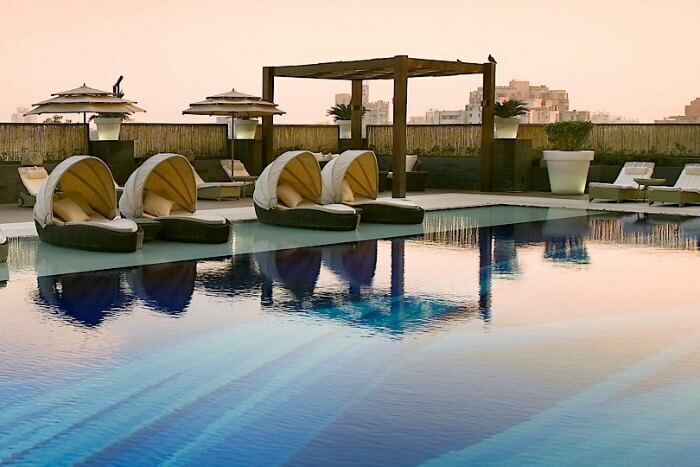 Other than these, one can book the lavish ballrooms and expansive lawns of places like Hotel Haut Monde, Pullman & Novotel, Four Points By Sheraton, Jhankar Garden, The Muse Sarovar Portico, Mapple Emerald, Aapno Ghar, Club Florence, The Claremont, and Ramada Gurgaon Central. 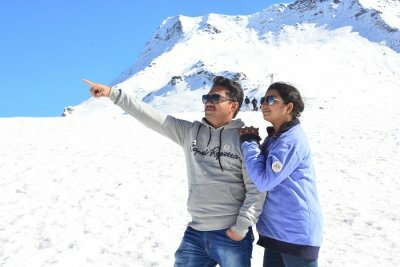 ii) Who is the best destination wedding planner in Gurgaon? A. There are many experienced and amazing wedding planners in Gurgaon that strive to make your big day as memorable an affair for you as possible. 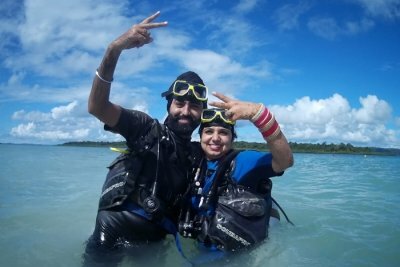 It’s not possible to single out a particular one as each is a master in their art and can provide impeccable services on your marriage and all events revolving around it. 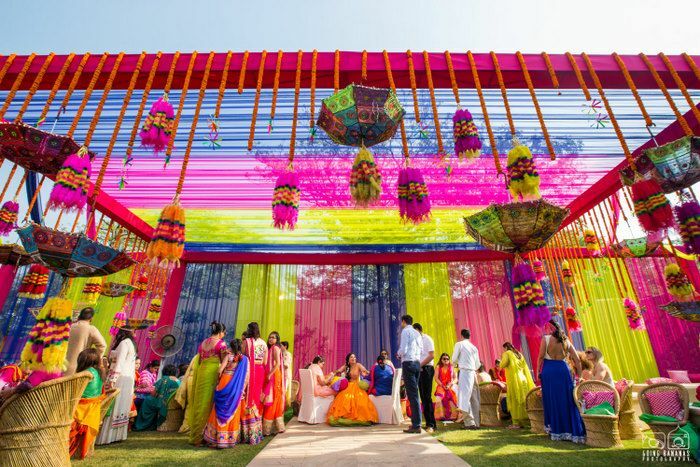 Some of the best wedding planners in Gurgaon include Theme Weavers, Social Butterflies, 7 Event Studios, Knots, Design My Wedding, and Creme De La to name a few. iii) What is the parking capacity of Klub Karma? A. Klub Karma provides indoor parking with a capacity of up to 1000 cars. The club also provides valet parking.